Morning drive from Islamabad to Katasraj Temples via Motorway & leave Motorway at Kalar Kahar interchange for Hindu temples. Proceed to have a detailed visit of the temple complex. 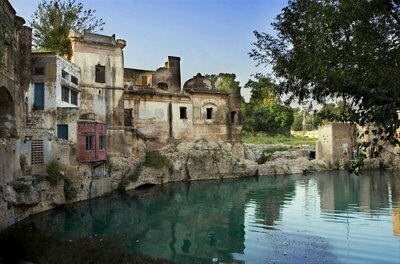 Katasraj Mandir is a Hindu Mandir located in Katas village in the district Chakwal in Punjab province of Pakistan. Devoted to Shiva, the holy place has existed from the time when the days of Mahabharata and the Pandava brothers spent an ample part of their exile at the site. Government of Pakistan considered & nominated the temple complex for World Heritage Site status. Most of the temples, located some 40 kms from Chakwal city in the Potohar region of northern Punjab, were built during the rule of Hindu kings. These temples were built around 900 years ago or more, although the first of Katasraj temples dates back to the later half of the 6th century A.D. The Mandir was forsaken by local Hindus when they migrated to East Punjab in India during partition in 1947. Government of Pakistan has spent millions of Pak rupees to restore the temple complex in three phases. After detailed visits drive back to Islamabad or Rawalpindi.